NEW YORK, April 25, 2018 /3BL Media/ -- Citi today released its 2017 Global Citizenship Report, highlighting efforts made in the last year to responsibly provide financial services that enable growth and progress. 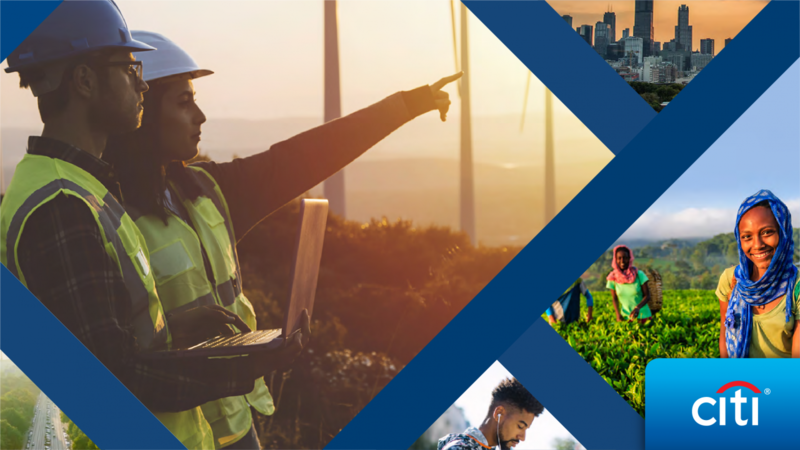 This report includes numerous examples of how, through our core business and with our philanthropic efforts, we are helping address complex and pressing issues such as global warming and social inequality. Section one of the report, “How We Do Business,” describes our commitment to responsible business practices, which are the backbone of our company’s success and are also imperative to protecting the broader financial system and the communities in which we live and work. Section two, “Solutions for Impact,” includes examples of how Citi is well positioned – through our expertise and resources - to help address complex social and economic challenges around the world. Sustainable growth: Citi continues to make progress toward its 10-year $100 Billion Environmental Finance Goal. After adjusting our methodology in 2017 from counting the fair market value of deals included in the goal to instead calculating Citi’s direct share of the project, we have contributed $57 billion toward sustainable growth from 2014-2017. This new approach is based on established finance sector league table accounting, and demonstrates our commitment to addressing climate change through business activity and a willingness to learn and adapt as the field of environmental finance continues to evolve. We also announced a new goal in 2017 to use 100 percent renewable energy to power Citi’s facilities globally by 2020 – covering more than 55 million square feet of real estate in nearly 100 countries. Human rights: Citi released its first UK Modern Slavery Act transparency statement, summarizing our approach to eradicating modern slavery in our operations and supply chain, including information about our governance and policies related to modern slavery, risk assessment and due diligence processes, and training. Digital innovation: Citi launched the Tech for Integrity Challenge (T4I) – a cross-sector collaboration to encourage technology innovators from around the world to create cutting-edge solutions that promote integrity, accountability and transparency in the public sector and beyond. Future of work: Through the Citi Foundation’s Pathways to Progress initiative, more than 200,000 young people have moved towards their career goals as part of our global commitment to prepare a next generation workforce. In 2017, the Foundation committed $100 million to reach more than 500,000 young people by 2020 and equip them with the workplace, entrepreneurship, and leadership skills necessary to compete in today’s economy. As part of Pathways, more than 3,500 Citi employee volunteers mentored and coached youth globally. Affordable housing & thriving small businesses: Citi provided over $4.7 billion in loans for affordable housing projects in the U.S., covering 28,700 units in 129 cities, serving as the leading financier of affordable housing in the U.S. for the eight consecutive year. Citi invested more than $11 billion in small business lending in the U.S. To date, the Citi Foundation has invested more than $23.5 million in microfinance networks and institutions, and provided $10.5 million in cash prizes to more than 6,000 entrepreneurs through the Citi Microentrepreneurship Awards. Innovative local government & community change agents: Citi helped manage a $300 million, three-year vaccine bond for the International Finance Facility for Immunisation, a fundraising organization providing development assistance. In New York City, the Mayor’s Office for Economic Opportunity, the Mayor’s Fund to Advance New York City, and Citi Community Development launched the nation’s first-ever municipal Service Design Studio and toolkit dedicated to making public services for low-income New Yorkers as effective and accessible as possible. Volunteerism: Citi celebrated its 12th annual Global Community Day, when 100,000 Citi volunteers, with friends and family, took part in volunteer projects in more than 500 cities located in over 90 countries. This report is in accordance with the Global Reporting Initiative (GRI) Standards: Core option and aligned with the United Nations (UN) Global Compact and UN Guiding Principles on Business and Human Rights frameworks. 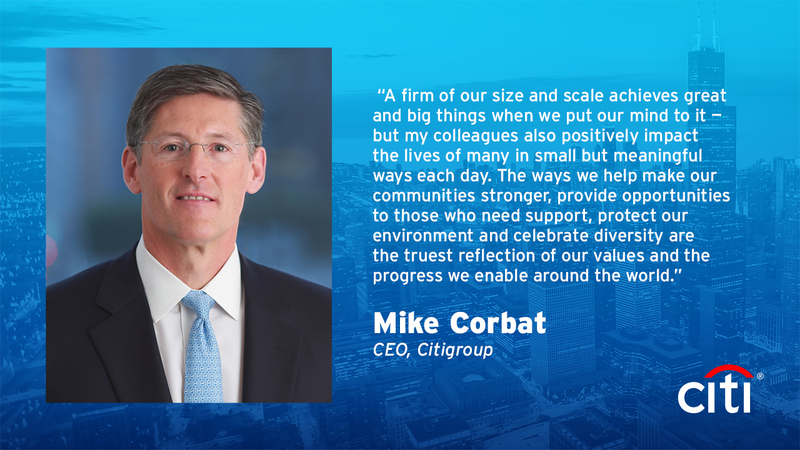 To learn more about Citi’s citizenship efforts across the globe and to review the 2017 Global Citizenship Report, visit http://citi.com/citizenship/.